We as a company have friendly staff that want to help, and more importantly are qualified to help you in the selection and purchase of the materials you require for your project. With each member of staff having over 20yrs each in the Building supplies industry we know what we are talking about. We as a company strive for perfection in what we do, and hope that this is passed on in the satisfaction that our customers enjoy and have enjoyed since 2005. Delivery is normally 1-3 working days for most building products. Brick deliveries can have longer lead times depending on manufacturer and haulage availability. 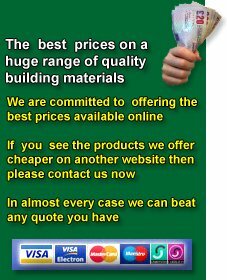 If you are in England deliveries of building materials are normally free except for small orders where a delivery charge may apply. If you are in Scotland or Wales a small delivery charge may also be applicable but please do contact us and ask as this is not always the case depending on your requirements.